The 1" LY-507HD ID holder lanyards are super large size models, great for lanyard holder for carrying heavier sports IDs and promotional material with safety breakaway function. Made of comfortable to wear 1" heavy duty polyester webbing, the 1" safety ID card lanyards are one the great sellers. Good for school, hospital, factory, or any place with extra safety required. Even single break away safety name badge lanyards, you can have a choice of put your break away on left hand side, or right hand side, or in the back of your neck. You can have the choice 2 or 3 safety breakaway buckles too. Custom printed or without custom printed model available. Any safety name badge lanyards with custom colors, sizes or hardware attachments are welcome ! 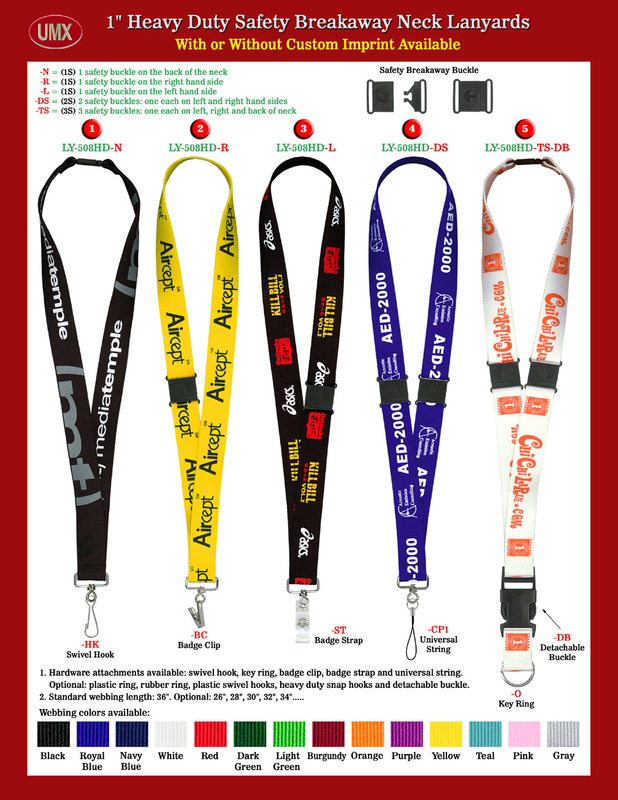 You are viewing Lanyards > Safety > 1" LY-508HD Super Large Heavy Duty Safety Breakaway ID Card Lanyards.